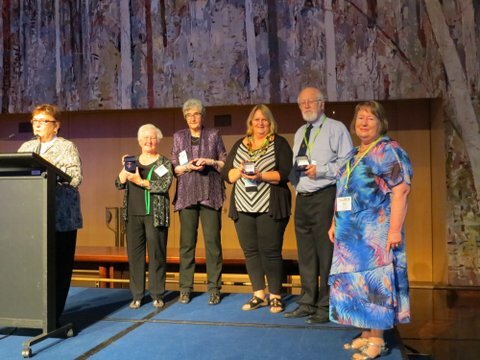 This is the third and final report on AFFHO Congress 2015. Post One on the first two days is here and Post Two on the last two days is here. In this post I will be looking at the two social events and all the sponsors/exhibitors as these are also a key part of any events success. The welcome meet and greet was Thursday night, before Congress started and was held at Anzac Hall in the Australian War Memorial. There were lots of people there and I managed to say hello to lots of old geneafriends and even met some new ones. The drinks seemed to be in plentiful supply but the food seemed to be a little more scarce, although that might have depended on where you were located. It can’t have been easy serving so many people. 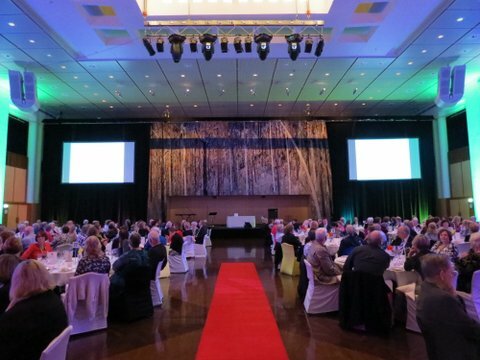 The conference dinner was held at Parliament House in the Great Hall with the magnificent (depending on your view point) Great Hall Tapestry by Australian artist Arthur Boyd looking down on us. Again there were lots of people and tables and I thought the food and drinks all really good. Thanks to Jeanette Hahn from HAGSOC for sharing her photos of the night with me. The launch of the Irish Anzacs database took place before dinner started and as I sat there trying to listen to what the speaker was saying, I suddenly realised I have an Irish Anzac. My GG Grandmother’s older brother Robert Finn had been born in Ireland but enlisted in the AIF in WW1 making him an Irish Anzac. So I need to follow up on this project as Robert never married and therefore has no direct descendants. It is traditional at Congress dinners to make any presentations for AFFHO meritorious service awards and this Congress there were two. Dr Neil Gunson from Canberra and Heather Garnsey from Sydney. Both well known identities on the Australasian genealogy scene and well deserved. It was also an opportunity to present past winners with the new meritorious service badge so Jan Gow, June Penny, Andrew Peake and myself were called to the stage to receive our badges. Eric and Rosemary Kopittke were presented with their medals the next day. We can now proudly wear these at AFFHO events (much easier than carrying the trophy around, not that any of us did). The exhibition area was huge and well spaced with a number of tea/coffee stations and food areas so that we could easily get refreshments and then have a look around the displays. The exhibitors also had brochures or whatever in the conference satchel although I managed to collect more ‘stuff’ as I went around. Amazing how heavy paper gets! There were four magazines, the March issue of the National Library of Australia magazine, Jan/Feb Inside History Magazine, March issue of VIC GUM News and Jan 2015 issue of Australian Family Tree Connections (AFTC). All had an exhibition area except for AFTC. Carol Baxter had a stall selling all her books so I picked up a copy of her new Help! Why Can’t I Find My Ancestor’s Surname which comes with two ready reference sheets. Looking forward to reading this. The other substantial reading matter was the 2015 edition of the Federation of Family History Societies Really Useful Information Leaflet which is available online here. Oops, almost forgot. I also collected a copy of my new research guides published by Unlock the Past. Discover Your Sporting Ancestors: It was not all work and no play which was the subject of my presentation on Day Two and Where Do I Start? : a brief guide to researching your family in Australia and New Zealand. Findmypast was the platinum sponsor and they had a number of staff and laptops helping people doing FMP searches as did FamilySearch and Ancestry. All those areas were kept busy. As a former archivist/librarian I visited the National Archives of Australia, State Records NSW and National Library of Australia/Trove display areas, almost makes me think about full time work again as there are so many new and exciting projects happening. Other exhibitors included Openbook Howden (publishing family histories), Genealogy SA, Preservation Australia (conservation and preservation services), Replayu (video recording your family stories), FIBIS (Families in British India Society), Momento photobooks, Finders Cafe (part of the Global Social History project), Anthologie photobooks, Huguenot Society of Australia, Gould Genealogy & History, Unlock the Past (publications and genealogy cruises), Teapot Genealogy, Guild of One Name Studies and Endangered Heritage (conservation and preservation services in Canberra). Additional information material in the satchels from MyHeritage, Pastkeys, National Institute of Genealogical Studies (offering a free course to attendees), Anchor Books, Western Australian Genealogical Society and Kate Bagnall‘s Chinese Australian Hometown Heritage Tour. which looks fantastic and I don’t even have Chinese ancestry. So the little table in my study is groaning under the weight of all this additional reading material plus there are all the little ‘to do’ notices scattered throughout my conference notes. Just about every talk I went to gave me something to follow up on my own families, in some cases, lots to follow up. I also took the opportunity to talk to everyone about National Family History Month and even gained a few new prize sponsors which was fantastic. The National Archives of Australia confirmed that they will again sponsor the launch which will be our 10th anniversary! But I will blog about NFHM 2015 separately soon. As well as all this there was some serious networking and chatting going on and most of Ancestry’s Speakers Corner sessions were fully attended for those who wanted to listen to something at lunch time. I caught Jill Ball‘s session on geneablogging so I hope lots of attendees went home determined to look into blogging more. There were also pre-booked lunchtime expert sessions which were totally booked out pre-Congress so that occupied some people as well. I must also thank long time friend Sue from Caloundra Family History Research for driving Max and myself to the social events. Originally we had planned to use the Congress shuttle bus but with his unexpected broken leg not quite healed yet we had to find another way of getting him there. So thanks Sue, it was appreciated. The whole Congress went smoothly, the venue was good, the session chairs and speakers all kept to time, the catering was excellent and plentiful and there was not once that I found myself queuing for the women’s toilets (usually a major bugbear at venues). My only criticisms would be ones that I mentioned in my first two reports. I really do believe that all conference papers should be published in the proceedings. If a paper is not to be published, then attendees should be told in advance so that they can choose to go to the session or not. How many people missed a session thinking they could read about it later? Secondly, I don’t think speakers should be allowed to give the same talks that they gave at a preceding conference. Or if they are, this should be clearly stated in the program. I did recognise some talks from the Adelaide conference and chose different sessions but was caught out with one. In closing the Conference convenor and organising committee should be congratulated on a job well done. All of the volunteers (purple people) over the entire conference were wonderful assisting with all kinds of tasks. In my opinion this was the best Congress that I have ever attended and there have been a few. AFFHO Congress 2018 in Sydney has a very hard act to follow but knowing most of the Committee, I am quietly confident that it will be another Congress you won’t want to miss. Well done everyone in Canberra and good luck Sydney! Thank you Shauna. The exhibitors were very enticing weren’t they? 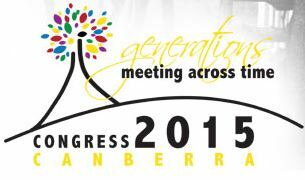 I am looking forward to attending Congress in Sydney.